The Arizona Desert in the summer is hot, but the AC is not. Most buildings are air conditioned to a surprisingly cool temperature, although even 80 degrees is chilly after being in 110+ degrees. To ward off the summer indoor chill, the AC-Proof Destashification Sweater was knit. The pattern used was a combination of two patterns. 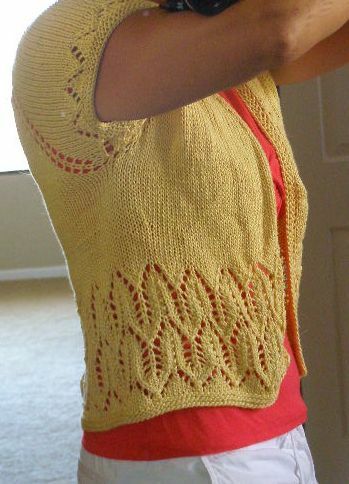 The Oriel Lace Cardigan by Kirsten Hipsky is what the cardigan was based on, but the lace pattern came from Bamboozle Cropped Lace Cardigan by Gail Tanquary. The yarn is a Bamboo worsted weight from The Stash. I do not know the name of the yarn. The color is a warm yellow, not the pale yellow in the detail photo. The Oriel Lace Cardigan Pattern is a top-down pattern – which I prefer. No pieces and no seaming. I have a “stash” of FABS (finished – all but the sleeves) pieced sweaters that I lost interest in. Someday…. 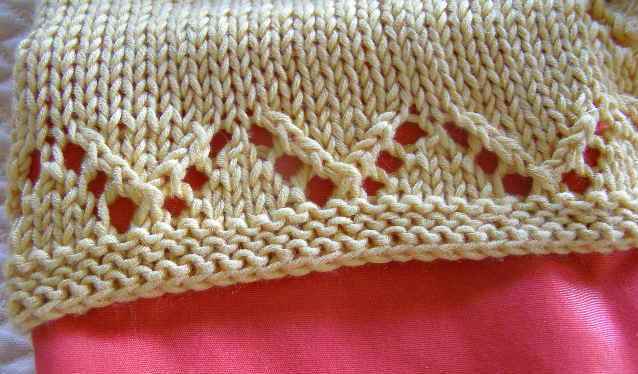 The lace on the sleeves is just the first few rows of the lace pattern from the Bamboozle sweater. The yarn does not have much body – it is “slinky”, more like a rayon. However, that is one of its benefits. Sweaters in Arizona need to be “packable”. Once one returns to the 110 degrees outdoors, it is just too hot to wear or even carry a sweater. But this yarn does not wrinkle! The sweater can be squished into a purse (or maybe a tote) and taken out again when needed! A quick shake – and AC-Proof again! AC-Proof and Wrinkle-Proof (OK, Wrinkle-resistant)! What more could one ask of a sweater! 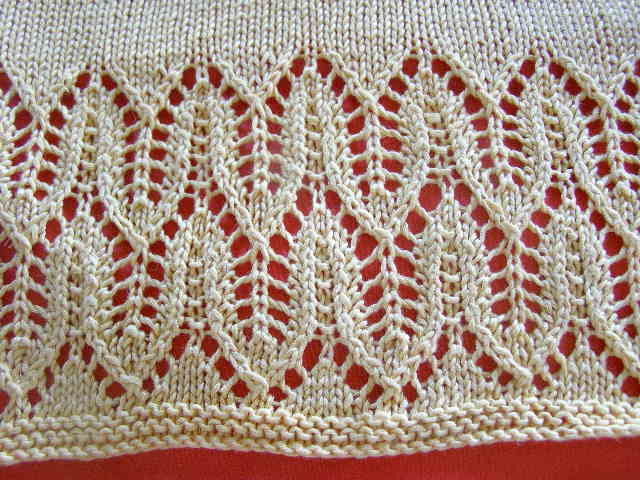 The links on this page are to the sweater patterns on Ravelry, the ultimate knitting site. Ravelry is free, but I believe it still requires a password. 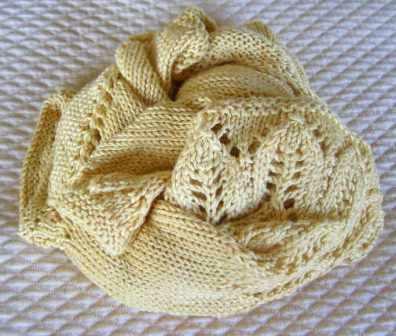 This entry was posted in Knitting, Stash Couture and tagged knitting, lace knitting. Bookmark the permalink.